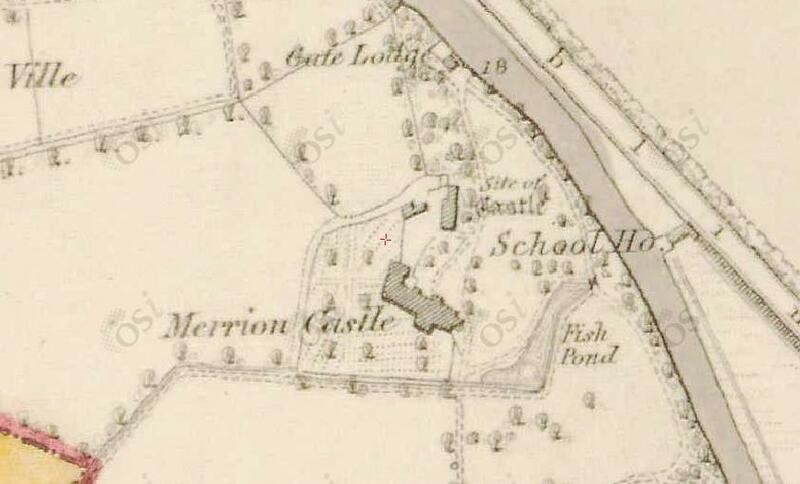 Merrion Castle stood opposite Merrion gates, in the grounds of what is now St.Mary's School for the Blind. The earliest mention of a castle there is in a deed of 1334. Came into possession of a branch of the Fitzwilliam family early 1400s. Came into possession of Thomas Fitzwilliam late 1400s. It was made the seat of the family by Sir Thomas Fitzwilliam, Kt temp c.1550. It was damaged in the 1641 rebellion in the time of the 1st Viscount Fitzwilliam but was afterwards restored. It was abandoned by 5th Viscount Fitzwilliam 1710. Merrion Castle had sunk into decay by 1729. This was reported in Walsh's Impartial News Letter, Dublin, 16 May 1729, which is a continuation of the Dublin Mercury. Can't find surviving copy. This was reported in the Flying Post, Dublin, 16 May 1729. Can't find surviving copy. The ruins of Merrion Castle were described by Austin Cooper in 1780, and were being removed in 1780-81. But a ruin survived for many years. A new building called "Merrion Castle" was built at the site. [Pettigrew & Oulton, 1834] shows "Merrion Castle" occupied by "Lady Harberton". 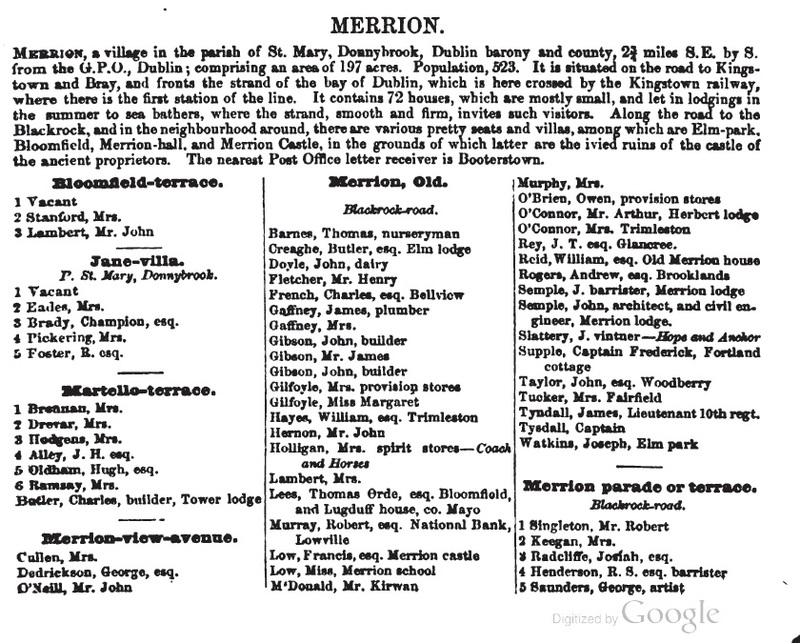 MERRION in [Lewis, 1837] lists "Francis Low" at the new Merrion Castle, and says the ruin of the old medieval castle is in the grounds: "In the demesne of Merrion Castle are the ivied ruins of the old castle from which it derives its name". [Pettigrew & Oulton, 1838] shows Merrion Castle occupied by "Francis Lowe". 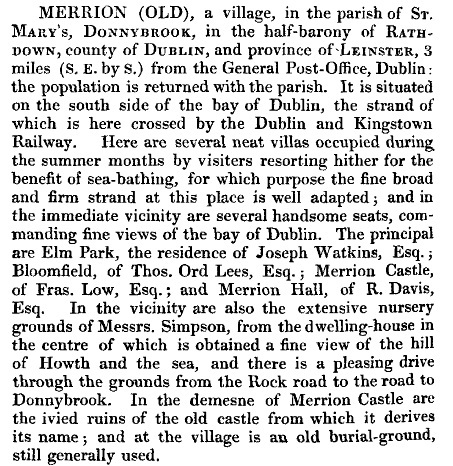 The entry for "Old Merrion" under MERRION in [Thom's, 1852] shows Francis Low at the new Merrion Castle, "in the grounds of which .. are the ivied ruins of the castle of the ancient proprietors." 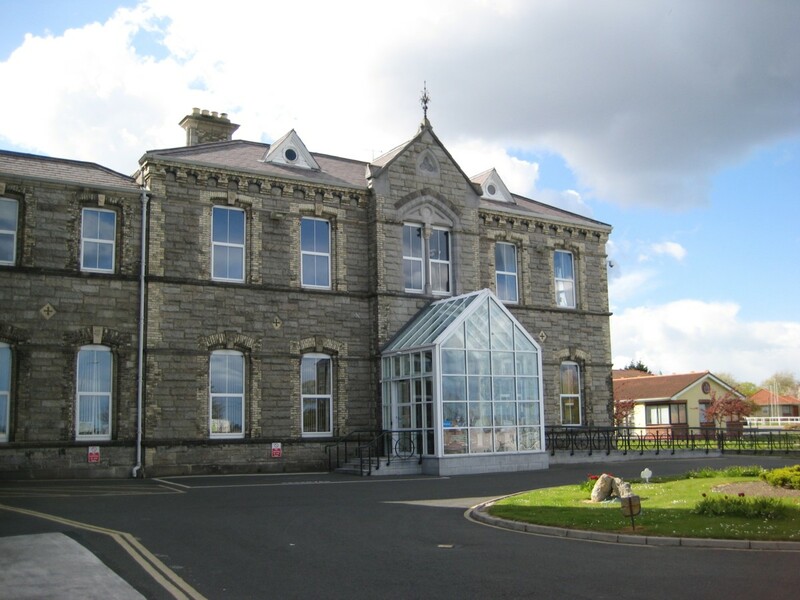 The Sisters of Charity set up a home and school for the blind at Merrion Castle, starting in 1865. 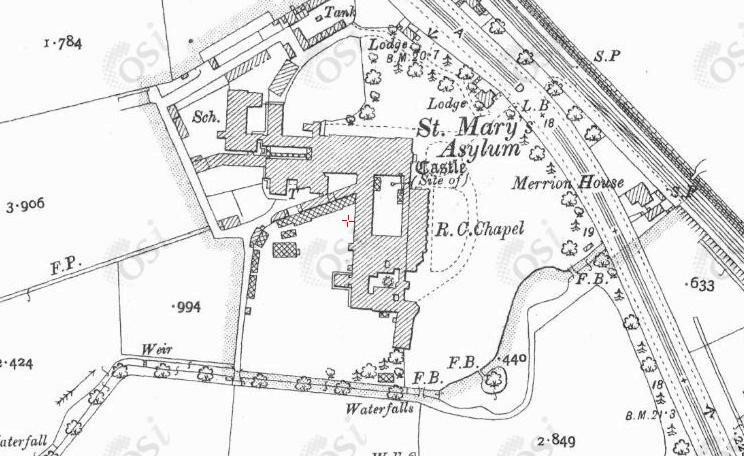 Page 470 in [Blacker, 1860-74] says that the new "Merrion Castle" became St.Mary's Asylum for the Female Blind in 1865 and "additions on an extensive scale" were then made to the building. [Smyth, 1994] says the ruin of the old medieval castle was only fully removed around 1866. [Wilkinson, 1925] says: "No vestige remains of the old castle, but some of the stone may have been used in building the Asylum for Female Blind which now occupies the site". The site is now St.Mary's Centre. A medieval stone plaque, bearing the Fitzwilliam coat of arms, survives at the site. A medieval stone head also survives. There is an area of residences at St.Mary's called "Fitzwilliam". 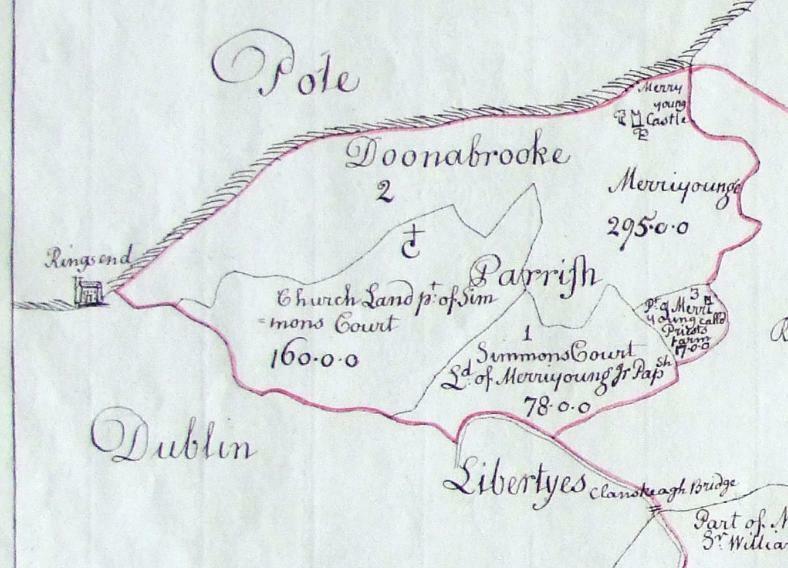 The parish of Donnybrook in the [Down Survey, 1655 to 1658]. E (sea) is up. Fitzwilliam holds most of the parish. 1st Viscount Fitzwilliam holds Merrion (plot 2 and plot 3) and Simmonscourt (plot 1). This is part of the larger map of Donnybrook and Taney. From TCD. 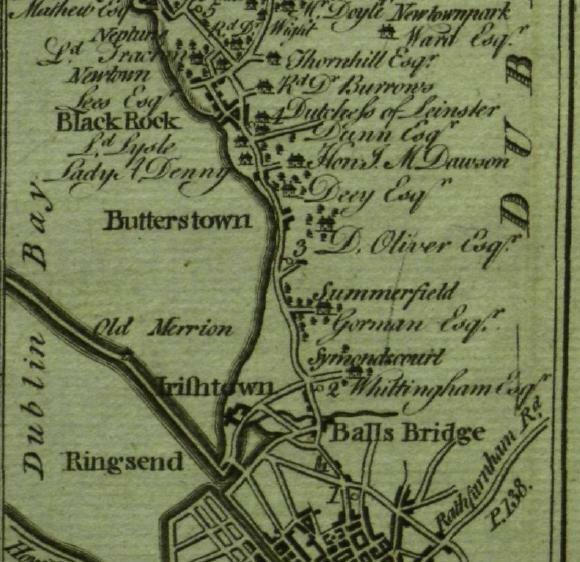 Merrion and Merrion graveyard on John Rocque's map of Dublin, 1757. Merrion Castle existed as a large ruin at this time. It must be the complex beside the stream, with the small bridge over it. To the NW are "Lord Merrion's Brick Fields". 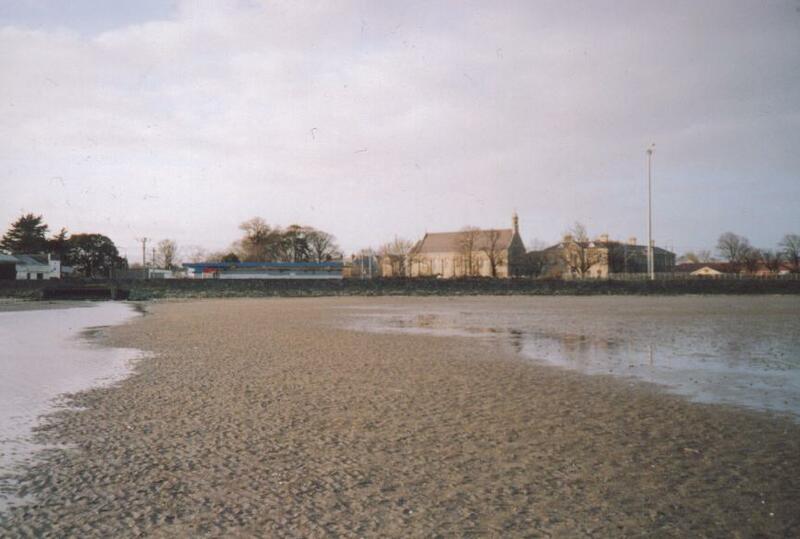 To the SE is Booterstown. 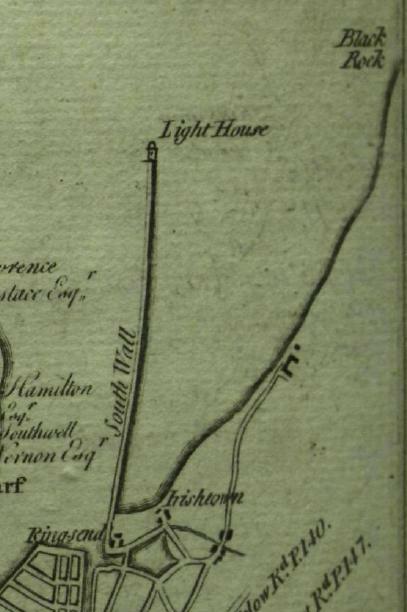 Merrion is visible (but not marked) in [Taylor and Skinner, 1777]. It is at the end of the road leading to the coast. Merrion in [Taylor and Skinner, 1777]. 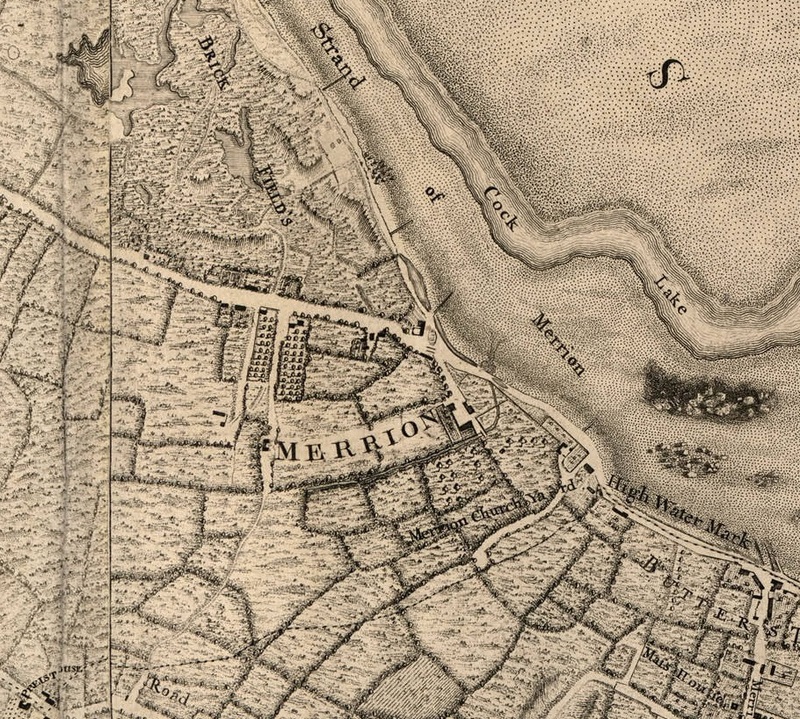 Merrion ("Merryon") on map of Dublin Bay, 1798. On display at National Maritime Museum, Dun Laoghaire. W is up. "Butters Town" is Booterstown. See full size and other shot. 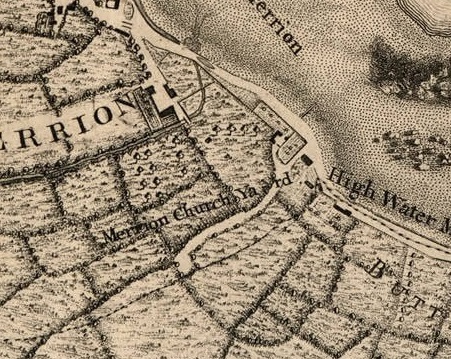 Merrion ("Merryon") on other copy of same map. 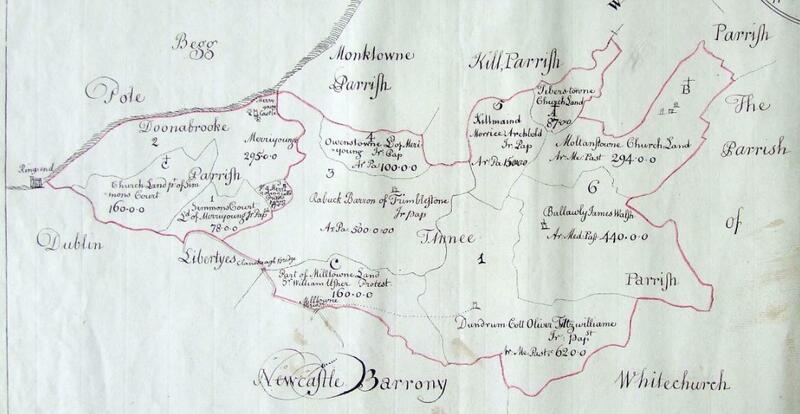 From South Dublin Libraries, which however thinks it is a map of 1728. 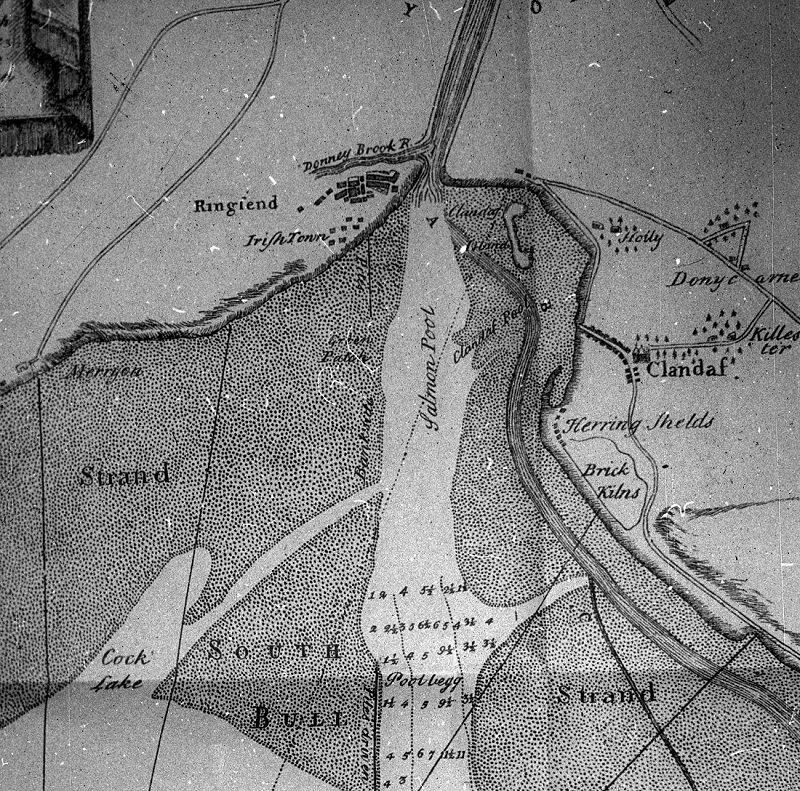 Merrion Castle site on 1829 to 1842 map. 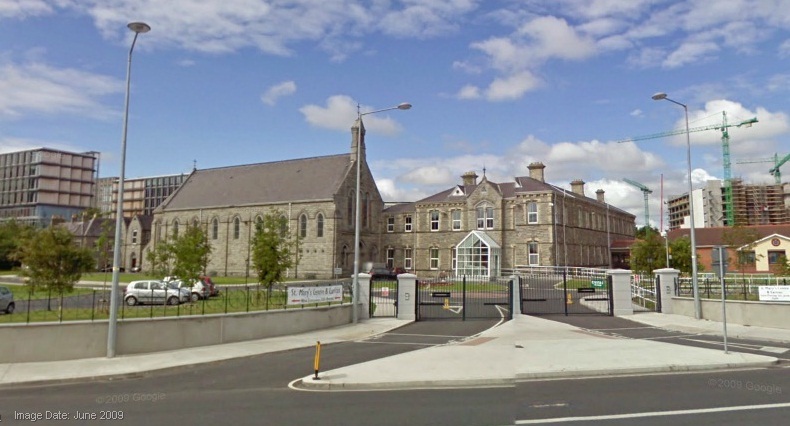 There is a new "Merrion Castle" building at the site. 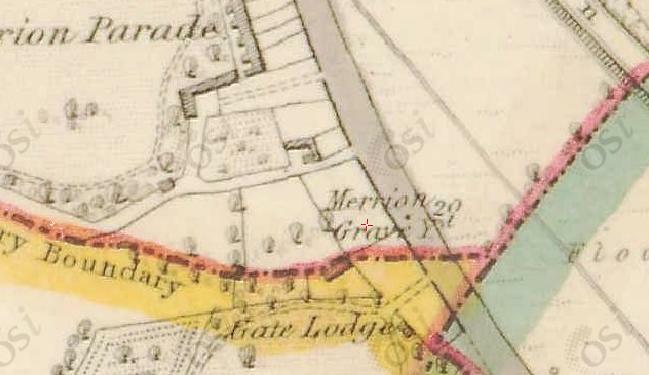 Merrion Castle site on 1887 to 1913 map. Elm Park Stream still flows today through the grounds. Site of castle is around front door of St.Mary's School for the Blind. Site of castle is around front door (porch) of St.Mary's School for the Blind. Photo 2012. See full size. Elm Park Stream ran through the grounds of Merrion Castle. 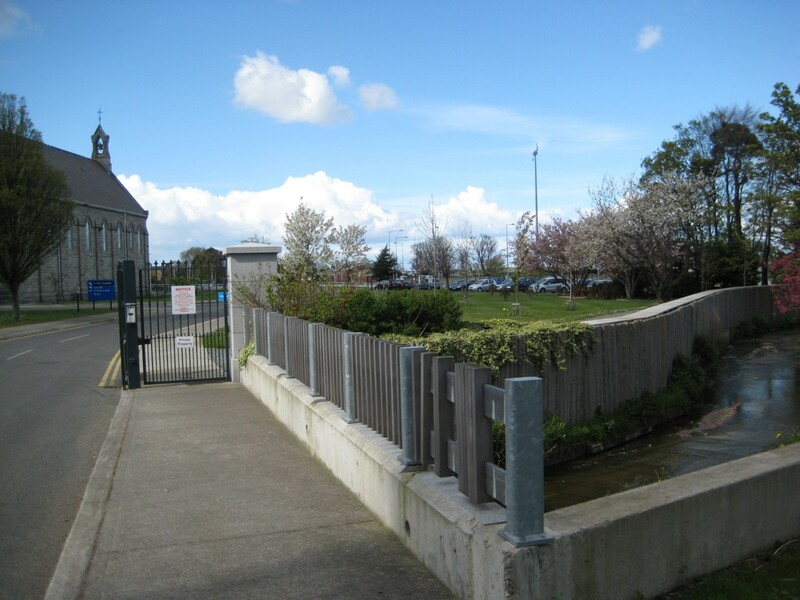 The stream still runs through the grounds, diverted underneath the Merrion Rd, discharges into the sea on the strand. Bridge over the stream, looking N, showing (on LHS) St.Mary's (the site of the castle) and (on RHS) the stream heading towards the sea. The Merrion Castle stream heading towards the sea. From the bridge above. 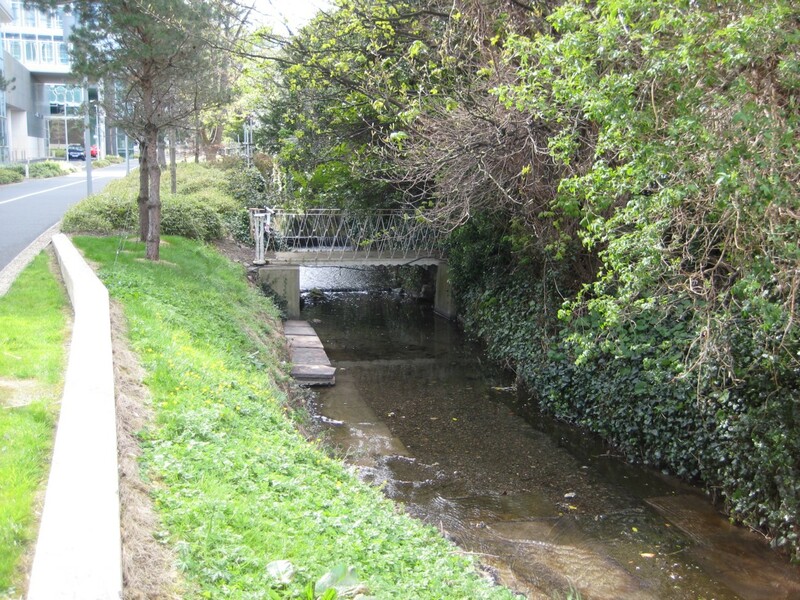 The Merrion Castle stream. From the bridge above, looking away from the sea (to the W). 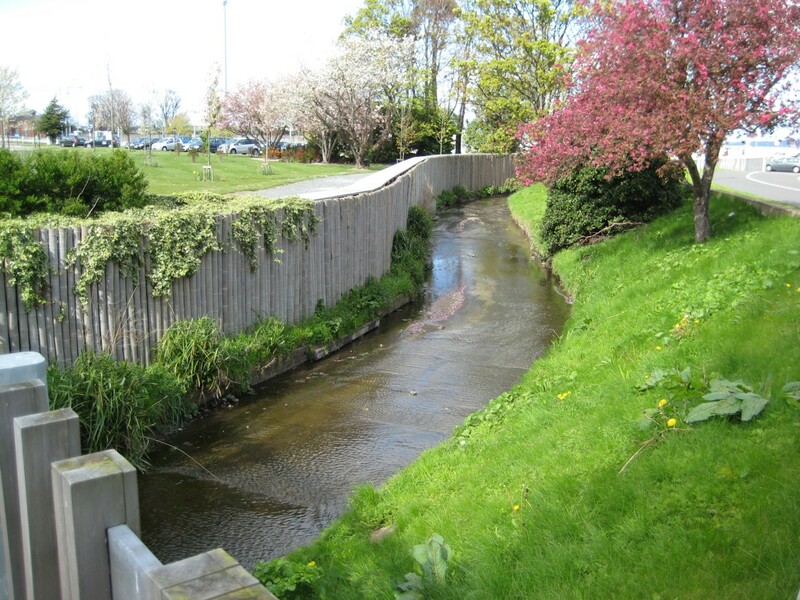 The Merrion Castle stream (Elm Park Stream) flowing through Elm Park golf club to the W.
St.Mary's (on RHS) from Merrion strand, showing on LHS where the Merrion Castle stream flows into the sea. Once the castle would have been the only building visible in this shot. 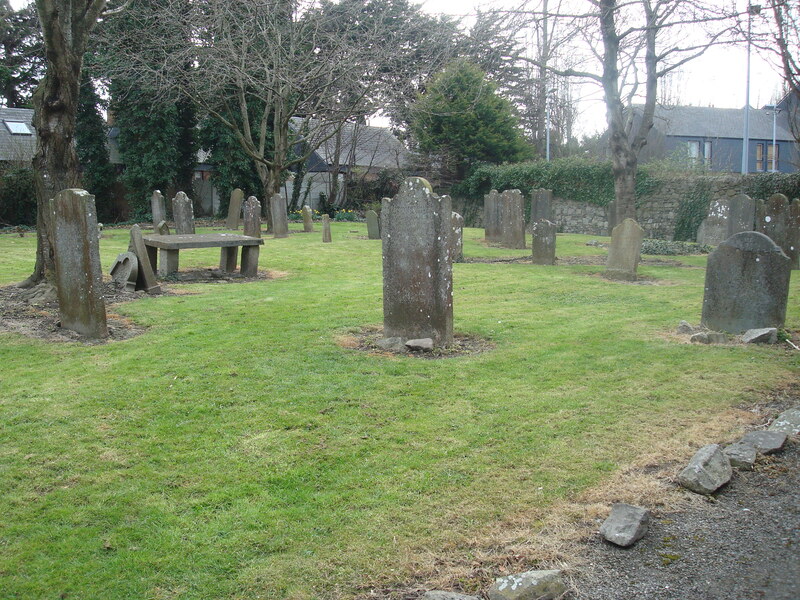 The site of the old Church of Merrion is now indicated by the old disused Merrion Burial Ground, small graveyard off the Blackrock Rd. This is beside the Tara Towers Hotel. No remains of church itself [Flanagan, 1996]. 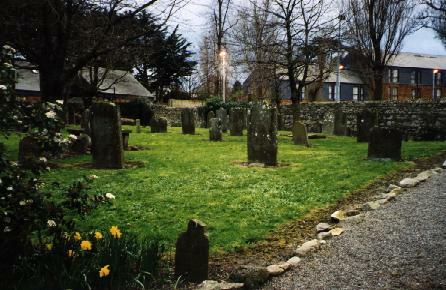 "Merrion Burial Ground" in [Flanagan, 1996]. Tombstone inscriptions in Merrion graveyard. IGRS. Memorials of the Dead, Dublin city and county, vol.2, [DCA] RR. 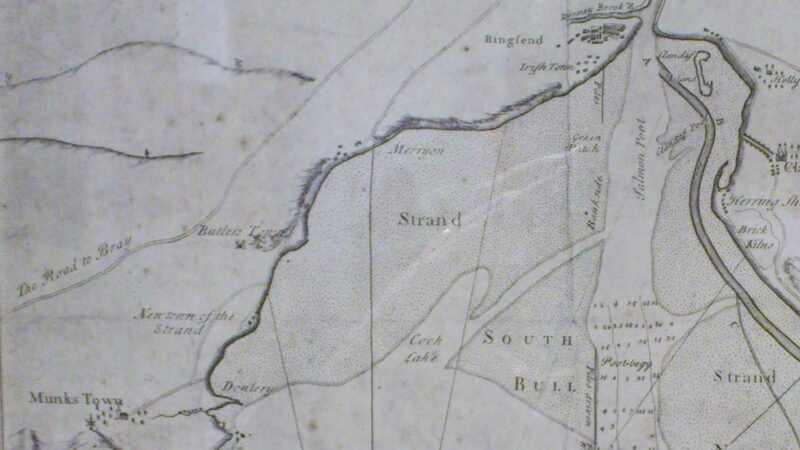 Detail of 1757 map above. Shows the laneway beside the graveyard existed then. 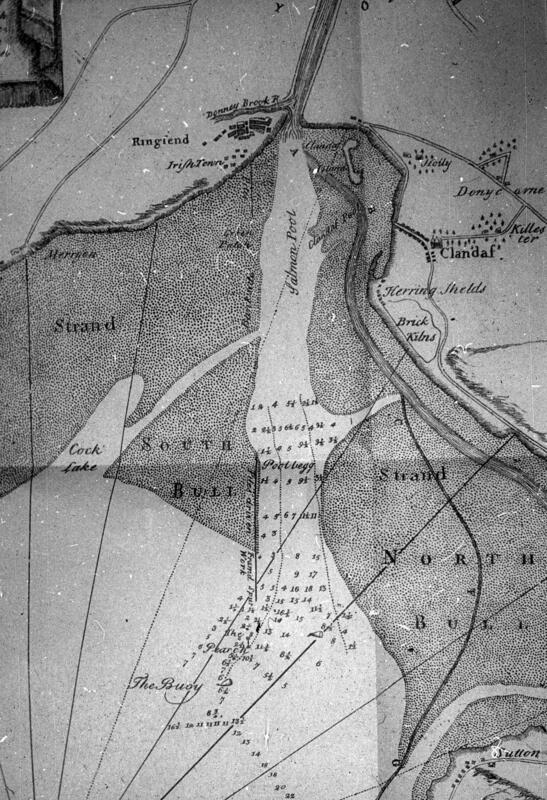 Merrion graveyard on 1829 to 1842 map. Photo 2010. See full size. From here.